Zaca Peak is one of a number of summits in the San Rafael Mountains that overlook the Santa Ynez Valley. Zaca Peak has the distinction of being the site of the first lookout tower in what is now the southern Los Padres National Forest. And while reaching the peak can be challenging, the remoteness of the site can make the effort worthwhile. The hike to the peak is about 7.5 miles round trip and follows the trails on the Midland School Property before entering the national forest. 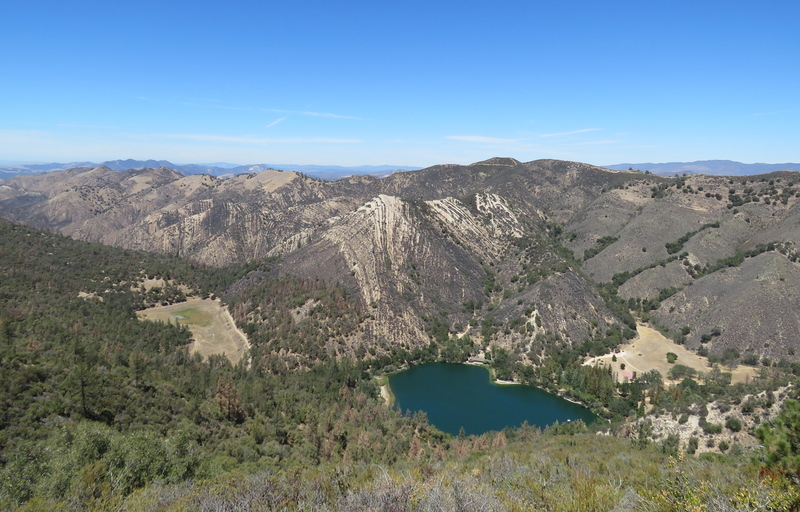 A relatively short extension of the hike can be made to include views of Zaca Lake. To get the trailhead from Santa Barbara, take State Route 154 to Los Olivos, and turn right onto Figueroa Mountain Road. The road leads through ranch land as it follows the broad valley of Alamo Pintado Creek. Along the way it offers views to the east of Grass Mountain and behind it, Zaca Peak. Figueroa Mountain Road crosses Alamo Pintado Creek just before it begins its climb towards Figueroa Mountain. And it’s here, just past the crossing, that one finds the trailhead for the hike to Grass Mountain and Zaca Peak. The trail is part of the network of trails on the Midland School Property. The trails are open to the public for hiking and horseback riding. Hikers need to fill out a day permit, which can be found in a box at the trailhead. Equestrian users need to contact the school directly in order to make arrangements for access. A sign with a large map of the trails is just past the trailhead along the main trail. From the trailhead, the main trail continues upstream along Alamo Pintado Creek through Birabent Canyon for the first .75 miles. Some of the trails are signed, but unfortunately Grass Mountain Trail is not. Grass Mountain Trail is first trail on the left, just past Maple Creek, which is a small side creek along the main trail. The hike from the canyon floor to the summit of Grass Mountain is best done during cooler weather. The trail is mostly exposed and gains roughly 2,250 feet over the next 1.5 miles. There is no water along the trail. Grass Mountain takes its name from its exposed southern side which is mostly covered in wild grasses. At about the 2.25-mile mark, the trail reaches the top of Grass Mountain, where one is treated to expansive views out across the Santa Ynez Valley. 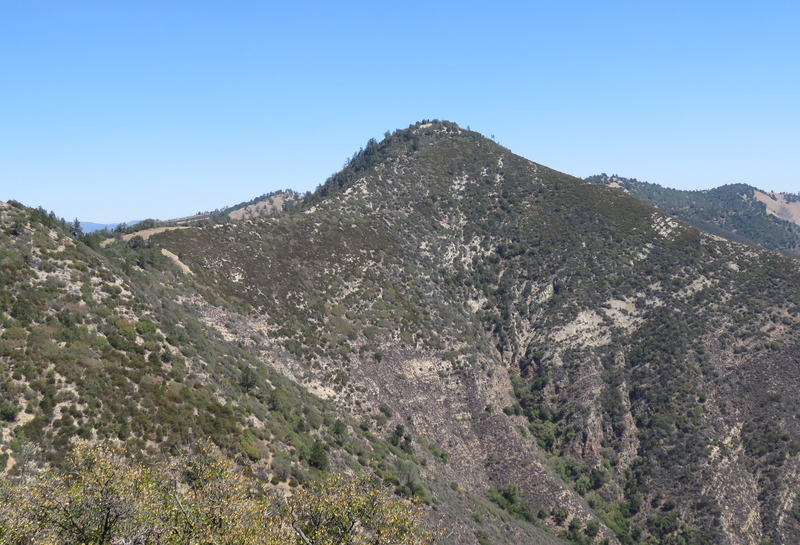 From the top of Grass Mountain, the trail enters the chaparral and continues along the ridge line that connects Grass Mountain to Zaca Ridge. The trail climbs to the top of an unnamed summit, where one starts to see coulter pines mixed in with the canyon live oak and chaparral. As the trail continues towards Zaca Ridge it offers some great views of Zaca Peak. At about the 3-mile mark from the trailhead, Grass Mountain Trail meets Zaca Ridge Trail. There is no longer a sign at the intersection, just the small metal post where the sign once was. From here, continue east a quarter-mile along Zaca Ridge Trail as it makes its way to the top of Zaca Ridge. To get to Zaca Peak, look for where trail leaves the ridge and continues east across the front of the peak towards Zaca Ridge Road. From here, leave the trail and continue up the ridge. There is no designated route to the top of the peak, but occasionally you’ll find what likes the route others have taken. The hike from the trail to the top is about a quarter-mile. At the top, one can find several wooden boards that are likely the remains of the lookout tower that was established there in 1914 by John Libeu. The wooden tower had a platform with a seat and was covered with an umbrella. During the summer months, a patrolman would ride up there on horseback and man the lookout. Libeu homesteaded the area around Zaca Lake in 1898, and served as the first ranger for the Pine Mountain and Zaca Lake Reserve, which later became part of Santa Barbara National Forest, the forerunner to today’s Los Padres National Forest. The impetus to build the lookout at Zaca Peak was likely inspired by the Great Fire of 1910. Also know as the Big Burn and the Big Blowup, the fire in many ways defined the forest service’s approach to fighting forest fires. The fire, which is the largest recorded forest fire in US history, burned 3,000,000 acres in northeast Washington, the Idaho Panhandle, and western Montana. And while the area in 1910 had an average amount of snowfall, by the time summer arrived it had seen little rain and was entering drought-like conditions. There was no single cause of the fire. In those dry conditions hundreds of small fires took hold. Some were started by careless farmers, loggers, and prospectors; more were started by the red-hot cinders from coal-powered locomotives that traversed the area. In July, lightning strikes added still more fires to the count, until by August, there were an estimated 1,500-3,000 fires burning across the area. By mid-August, it started to look like the fires were under control, but on August 20th, the weather shifted. Hurricane-force winds came in from the west. These 70-mile-an-hour winds whipped the hundreds of small fires into a single large firestorm that burned for two straight days, until the weather shifted again, and cooler temperatures and rain helped extinguish the fire. During those two days, 86 people lost their lives, 78 of them fire fighters. Five towns were completely destroyed. The Forest Service, which had just been created in 1905, did its best to contain the fire with its limited personnel and resources, until the firestorm forced those fighting the fire to retreat in order to save their own lives. In the aftermath of the fire, the debate between viewing forest fires as part of a natural cycle to be managed versus suppressing forest fires as quickly as possible effectively ended. New policies and practices were put in place that defined fire management for the forest service. Funding was made available for fire prevention and suppression. Roads were built that provided access into remote wilderness areas; lookout towers were constructed; and specialized crews of fire fighters were trained. During the 1930s, with the resources of Civilian Conservation Corps, even more roads and lookouts were built in the national forests. Over 200 new lookouts were built in California alone. When Libeu retired, the lookout at Zaca Peak was moved to nearby Figueroa Mountain. In 1965, the wooden lookout tower at Figueroa Mountain was replaced with one made of concrete and metal. The tower is still standing, but closed to public. 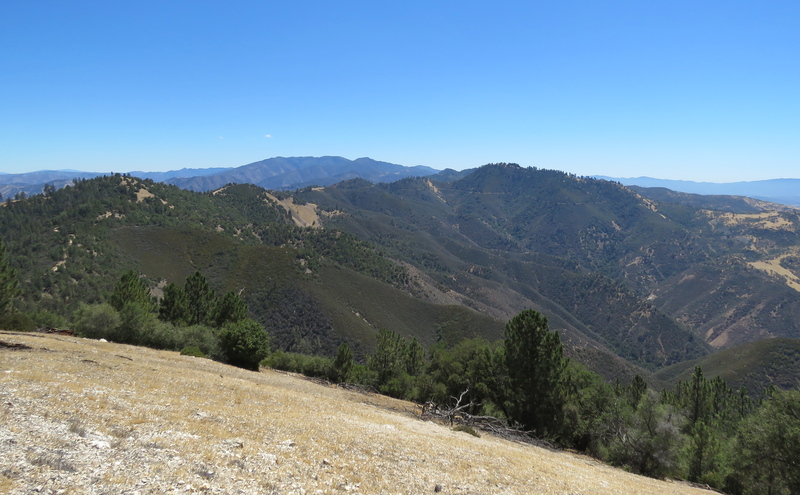 From the top of Zaca Peak, one can continue a short ways east to where the views open up to include Figueroa Mountain. Unfortunately, because of the topography, Zaca Lake is not visible from Zaca Peak. However, by returning back down to Zaca Ridge Trail one can extend the hike to include views of the lake. Continue west along Zaca Ridge Trail, past the turnoff for Grass Mountain. The trail is somewhat overgrown, but is still followable. About a quarter-mile past the turnoff to Grass Mountain, the trail rounds a corner in the landscape and offers views of the lake below. Zaca Lake is the only natural lake in Santa Barbara County, and although it has shrunk some because of the drought, the spring-fed lake still retains some of its blue color. From the ridge, if you’re lucky, you may even get to see a bald eagle. This article originally appeared in section A of the October 12th, 2015 edition of Santa Barbara News-Press. Zaca Peak looks wonderful. I will be in Malibu at the end of this month and I am looking for a quick overnight trip in Los Padres NF or somewhere else in driving distance. Do you have any recommendations? What kind of conditions can I expect in late April? Do the San Rafael Mountains get snow? Have recent fires effected the area? Any info you can give me will be helpful. Thank you for a nice blog. I have subscribed and will be back. Hey Steven, thanks for your interest. 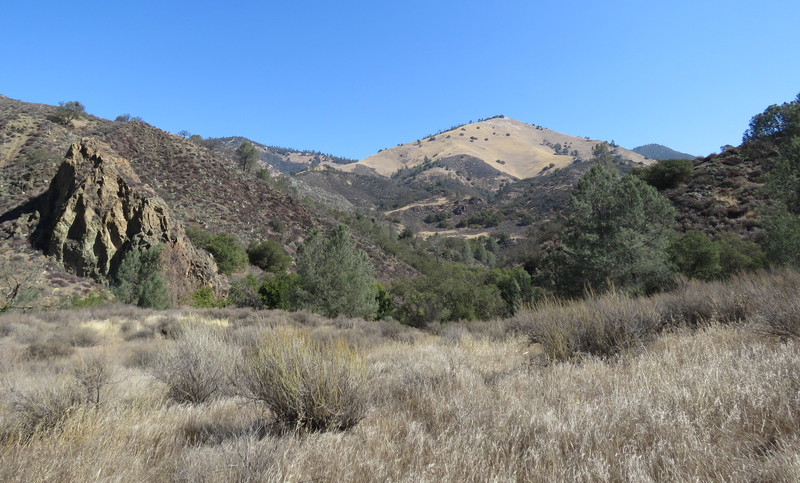 April is prime time for backpacking in the Southern Los Padres. The San Rafaels and other high mountains in our area can sometimes get snow in April, but not at the lower elevations. How many miles are you interested in covering? Manzana Creek offers a number of great destinations within the San Rafael Wilderness. The Gene Marshall-Piedra Trail over by Ojai also has some good overnight destinations. Neither of these two areas were affected in the recent fires, although part of the Manzana was burned in the 2007 Zaca Fire, but has grown back significantly. Thank you James. I’m not looking to do too many miles as I only have a few days. I’ll fly into LAX on a sunday…drive up and have to be in Malibu by Tuesday. So I’m looking for something that will get me in the woods for a night or two before my other obligations. So under 20 miles. (I don’t like to kill myself on miles). Do you have trip reports on Mazana Creek, San Rafel, Gene Marshall, or Piedra Trail? Some hikes you may want to check out are Manzana up towards Manzana Narrows. Heading upstream from Nira, there’s Ray’s Camp at 5 miles, Manzana Camp at 6 miles, and Manzana Narrows at 7 miles, so a lot of choices and flexibility there. The Narrows has four different camp sites. A nice day hike past Manzana Narrows is up to Big Cone Spruce Camp, 4 miles roundtrip. Here’s an article covering that area, https://songsofthewilderness.com/2018/03/31/trail-quest-big-cone-spruce-camp/. There would be water all of the camps mentioned this time of year. Along Gene Marshall-Piedra Blanca Trail, I think Bear Trap Camp makes a nice destination, 4.5 miles in. A longer hike would be up to Haddock Camp, about 8 miles in. Both sites would have water this time of year, https://songsofthewilderness.com/2014/12/23/trail-quest-reyes-creek/.